WE BELIEVE IN QUALITY - QUALITY OF GOOD COMPANY, GOOD AMBIANCE + GOOD FOOD. 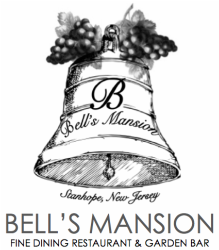 BELL'S MANSION IS LOCATED ATOP THE PERFECT HILL IN STANHOPE, NJ - RIGHT ACROSS THE MORRIS CANAL. ENJOY OUR SEASONAL OUTDOOR BAR AND TWO GARDEN PATIOS OR GORGEOUS VIEWS FROM OUR WINDOW LINED CANAL ROOM OVERLOOKING THE SCENERY. THE RESTAURANT IS ADORNED WITH MANY VINTAGE + ANTIQUE PIECES TO CREATE THE PERFECT ATMOSPHERE FOR YOUR QUAINT DINNER OR CASUAL NIGHT OUT. CELEBRATE ALL OF YOUR MILESTONES, YOUR FAMILY + YOUR FRIENDS WITH US. OUR DRESS CODE IS NEAT. OUR MENU IS A COLLECTION OF EUROPEAN + NEW WORLD CUISINE WHICH IS INSPIRED SEASONALLY, WE OFFER DAILY LUNCH + DINNER SPECIALS ASWELL AS BRUNCH ON SUNDAYS. EVERY DISH IS MADE TO ORDER + HOMEMADE. PLEASE NOTE THAT WE ARE NOT A "FAST FOOD" RESTAURANT AND WE WANT ALL OF OUR GUESTS TO ENJOY THEIR DINING EXPERIENCE BY OFFERING A RELAXED CLIMATE WITH SPACED OUT COURSES. WE DO ACCEPT RESERVATIONS HOWEVER WE CAN NEVER GUARANTEE A SPECIFIC TABLE REQUEST, WE DO NOT TAKE RESERVATIONS FOR OUR OUTDOOR DINING, IT IS FIRST COME FIRST SERVE. RESERVATIONS WILL BE HELD FOR 15 MINUTES, SO PLEASE CALL US IF YOUR PARTY WILL BE RUNNING LATE OR TO CANCEL.